Whether or not you are someone who believes in psychics, horoscopes, or even Nostradamus’ predictions for the future, this fun test is a great way to reveal a little more about your love life. 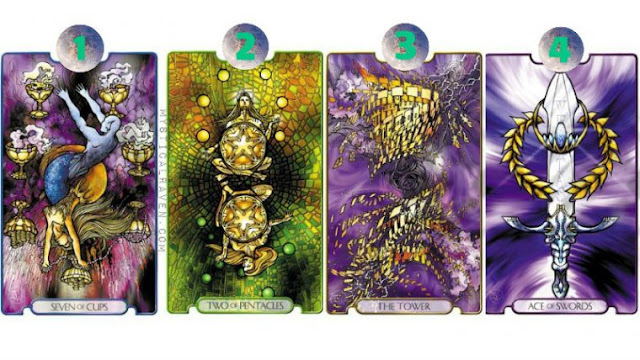 Just take a look at the four cards below. Which one calls to you? Try not to over think it. Just go with your gut reaction. Once you’ve chosen a card, keep reading to find out what your card reveals about you and your romantic endeavors! When this card appears in your reading you have to be ready to defend yourself. You have to be on your guard as the expectation of trouble is coming your way. If troubles are coming from your past, you must think really clear and hold your ground, even if you are tired and weary. Deal with it once and for all. The Seven of Cups card talks of perseverance, trying repeatedly and refusing to take “no” for an answer. You have to continue despite fatigue, slow stamina, toughness and strength. If you are single, the appearance of Seven of Cups in a reading might suggest that you are careful with relationships because you might have been hurt in the past. Try and analyze the things that went wrong and see where there is room for change. Now is the time to get yourself whole emotionally. When in a relationship, the apparition of this card may suggest that you have to be on guard because you might get hurt. Another meaning might be that a partner is very protective and you might feel suffocated. Tell him/her you need a little breathing space. The Two of Pentacles is likely to appear when temptation has wormed its way into your life. This card presents to us seven golden chalices each overflowing with a different object. The picture is quite serene and reflects the only outcome is either one of two options. You may feel as if you have too many options to explore and it leaves you feeling defeated, but this is not the case. The Two of Pentacles is pointing out this flaw in your plan, and is here to help encourage prioritization. In a relationship-oriented spread, the Two of Pentacles spells trouble. If you’re already attached, it means that you can expect some bumps in the road. At this time, it’s important for you to evaluate your relationship objectively. Are you being completely honest with your partner about your intentions? If you are looking for love, this means that your romantic pursuits may not be what they seem. If you are unsure about someone, do not jump into a relationship with them. This card is very likely to come up if your potential partner is not being honest about their emotional availability. Tower is all about your ability to assert yourself in a diplomatic and constructive way. It is also about your own personal growth and coming into your own by taking the reins and directing yourself down your path without stepping on the toes of others. It is a very powerful card and is generally a good omen in your readings. If you’re already attached, Tower in a love oriented reading is a sign that your relationship has stability and room for both parties to grow together in a healthy way. For those looking for love, this is a good sign that it’s right around the corner, so long as you’re putting yourself out into the dating pool. Right now is the best time to let your confidence shine through and meet the person of your dreams. The Ace of Swords is a card all about making steady progress in your life. It does not promise instant results, but it does bring it with happy endings for those who are steady on their paths. When the Ace of Swords appears in your relationship spread, it means that you’re in a good position to grow with your partner. It’s possible that you are on the verge of starting something new or learning something new about your partner. Be open and honest about your expectations of the relationship and do not be afraid to voice any concerns you have about the future. Now is the best time to figure out if you and your partner are on the same page, or if you want different things out of life.